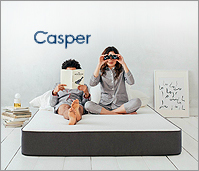 The Casper Mattress has a top comfort layer of premium latex and a support layer of high-density memory foam. Designed to be placed on any firm, flat surface. Casper offers a 100-night, no-hassle return policy and 10-year warranty. Core Construction: 3-Layer Foam Construction, Latex Foam, Visco Elastic Memory Foam, Polyurethane Foam. Casper Mattresses, luxurious Marriage of Latex and Memory Foam Sizes: Twin, Twin XL, Full, Queen, King, Cal King.